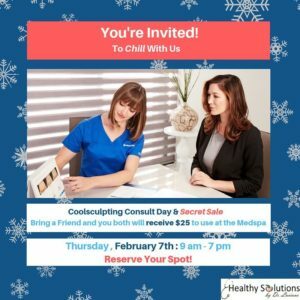 Thursday, Feb, 7 from 9 am – 7 pm for a VIP Coolsculpting Consultation Day & Secret Sale! ✅Learn about Coolsculpting – World’s #1 Non-Surgical Body Contouring Technology. ✅Bring a Friend and receive $25 to use at the MedSpa for the both of you.